Tomcat clover is an annual wildflower that is native to most areas in the western areas of North America. It is in the Fabaceae family (pea family). This plant germinates in wet winter or spring soils. The scientific name willdenovii refers to the German botanist Carl Ludwig Willdenow (1765-1812). This is a plant many like to grow in their gardens as it attracts pollinators. 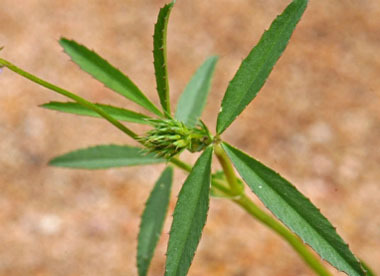 Distinguishing Features: This annual plant looks like a typical clover, but with extra long leaves. It is categorized as a wildflower, and it is delicate in appearance. It is somewhat gangly in appearance. Flowers: Inflorescence about 1 to 3cm wide, stalked, axillary cluster of 6 to 60 pea-like flowers, arranged in a wheel-like shape. Lavender to purple (sometimes purple-pink), 10 to 13 mm long. There are nine united stamens and one free, and the fruit is a mostly 2-seeded pod. Depending on geographic location, the flowers bloom between March and June. Fields of Nutrition has medicinal benefits and vitamin/mineral content of Tomcat Clover. Leaves: The linear-to-lance oblong or elliptic, green, leaves are alternate, and palmately compound. They grow in leaflets of 3, anywhere from 1 to 4 cm long. The margins are usually finely bristle-toothed. Height: Although soil and climatic conditions can alter the growth of this plant, typically tomcat clover grows to about 20cm (8”) tall. 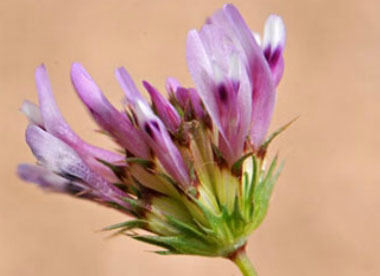 Habitat: This clover is primarily found in the western areas of Canada and the U.S. It also occurs in Idaho and Texas. Tomcat clover is also found in Mexico and South America. It is fairly common in grasslands below 5000' and it may be found near the edges of a desert. Tomcat clover also grows in disturbed areas and it can occur in wetlands. Edible parts: Leaves are edible raw or cooked. Typically they are better to use before the flower appears. Leaves can be dried to be used in soups, stews or teas. Seeds can also be used raw or cooked. If desired, saved seeds can be sprouted and used in salads. If dried and crushed these seeds can be used as a thickener. 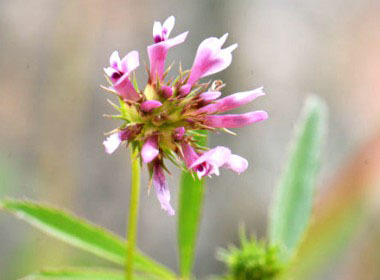 According to author Paul Douglas Campbell, in his book Survival Skills of Native California, the Miwok ate tomcat clover. They would eat the leaves, stems and flower buds raw or steamed in an earth oven.